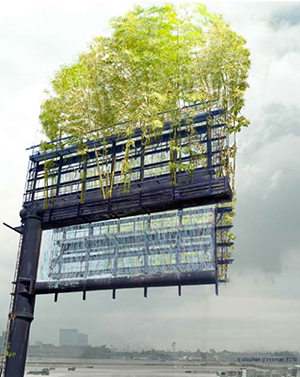 When commissioned to create one of these gardens in the sky, the team at Urban Air strips the billboards of their commercial facade and installs a series architectural planters filled with living bamboo trees. 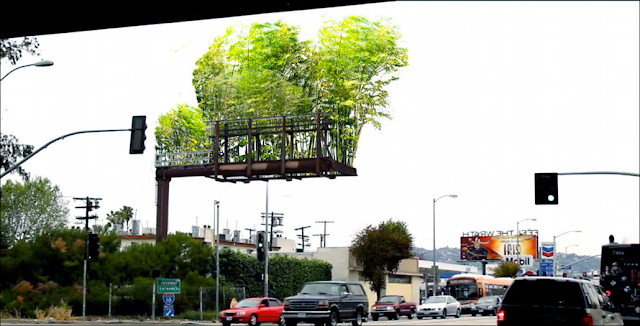 Creating a bamboo forest suspended in the sky, sure to brighten up everyone's commute to work. Wireless senses are used to communicate an array of data, monitoring soil moisture content, air temperature and air quality. It is also suggested that this information be publicly accessible on smartphones, further promoting green city living. As temperature in cities keep increasing, installations like these could, not only absorb harmful chemicals and pollutants out of the air but also help combat the 'urban heat island' effect. Most of a city's hard surfaces (metal, concrete, plastics) absorb solar radiation throughout the day, storing heat and then releasing it back into the local atmosphere. This leads to a localised increase in temperature in built up urban areas ranging from 1 to 6 degrees Celsius. Plants absorb this solar radiation during photosynthesis utilising the sun's energy to live rather than heating the surrounding area. Plants can further reduce the effects of this urban heat island phenomenon through evapotranspiration, where moisture from the leaves evaporates into drier, warmer air, providing a natural cooling effect. I think this is a great idea, taking under utilised space to a new level! I wonder if bamboo would work in Melbourne or whether the climate is too harsh. Maybe various succulents could work?